The land were the prairie skyscrapers still stand - there's more out here than corn crops, cows, and dusty flatland. 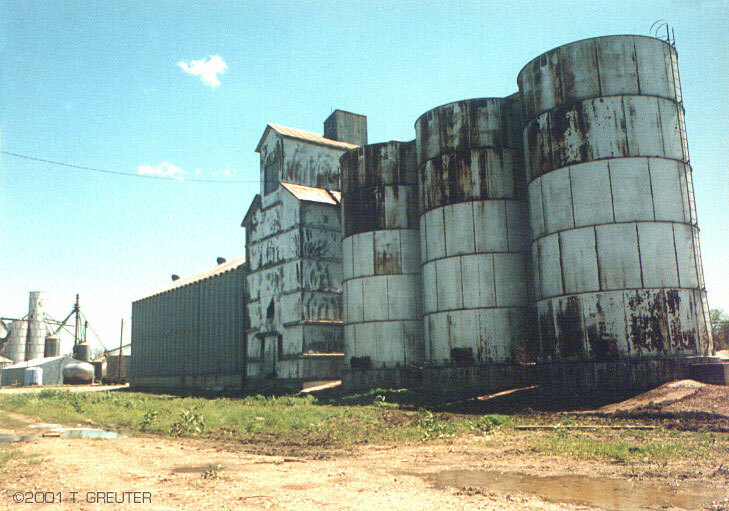 Farm country, grain elevators and branch lines lie scattered across the prairie grass that lies on the former Missouri Pacific's Northern Division, of the line's Westen District. Trace the path of the rail line - all up and down the MoPac right of ways - in service, abandoned, preserved or forgotten. To help give you a general feel of things, we'll map ot the region going by MoPac's April 15, 1973 employee's timetable. First, MoPac divided its system into four districts; Eastern, Western, Texas, and Gulf. Nebraska and Kansas come under the Western District. Secondly, the Western district was itself divided into four divisions; the Northern, Kansas City Terminal, Kansas, and Central. Omaha, Lincoln and Falls City lie in the Northern, while Prosser and Hastings are in the Kansas. Finally, these divisions were divided into subdivisions or 'subs'; the Hastings, Louisville, Lincoln, Crete, and Omaha sub. With the merger of the MoPac with the Union Pacific, reclassification/naming throughout the system was inevitable. Today the Omaha sub is the Falls City Sub. Without warning, a sudden thunderstorm angrily rumbles over a farm east of Walton, NE. 4/5/97. 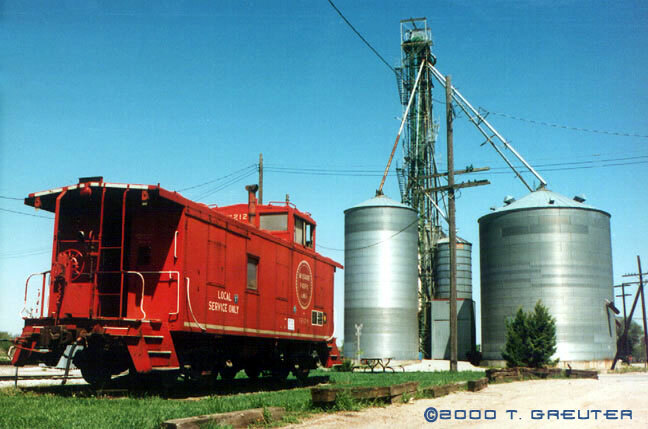 All of the MoPac's Nebraska branches and the Omaha Division mainline (Omaha to Falls City) were a very interesting mixture of big-time mainline action and small-town railroading with diverse topography, rural towns, trains of all sizes. Look at the map - of course there's the two mainlines - the Omaha Divsion which reaches down to the big MP town of Falls City; the Louisville running from South Omaha on rolling hills to Weeping Water. Lincoln Branch east to to Union connection; the Mo. River setting of Nebraska City; the Crete branch from Talmage on the Omaha Division west through grazing pastures ending at Crete; the Northern Kansas Division with it's Prosser branch running up into southcentral Nebraska. All three branches met with Burlington Northern, some criss-crossed the C&NW, UP or Rock Island. 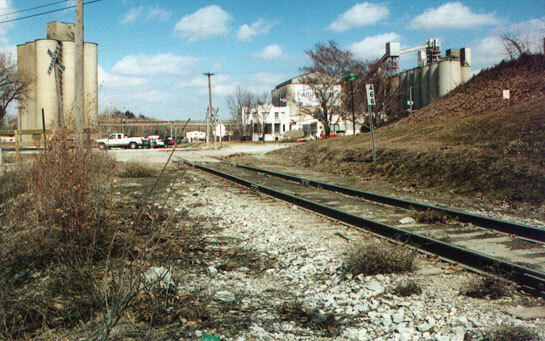 When most branchlines were dropped after the merger, the Louisville Branch is still around today as an industrial extension off of Weeping Water, itself a preserved industrial line from Union.Weeping Water's depot was still intact up until the late 1990's and the ornate Falls City station, though dormant, still stands. This old map of Southeastern Nebraska shows MoPac's original Omaha, Lincoln, and Crete connections. Many of these small towns sprung up from the prairie grass overnight with the advancement of the railroad. MoPac also extended into the south central portion of the state from Kansas (not shown). Originally the branch lines were to extend further westward, but this plan never materialized. 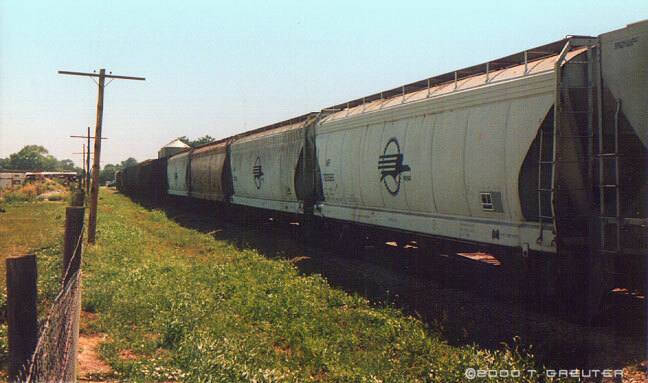 The Omaha-Falls City-Kansas City mainline remains alive today, while the branchs were dropped. 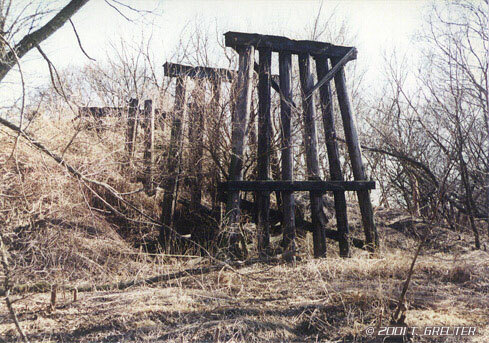 A portion of Lincoln Branch is one of the luckier abandoned lines, with strong public support it's been preserved today as part of the Great Plains Trails Network. The Omaha sub extended as far east as Neff yard in Kansas City, Missouri, but for our purposes we focus only as far as Falls City. Omaha is and was a big rail town, being the headquarters of the Union Pacific and the converging point of a number of lines. Being the northernmost extension for MP, Omaha-ha was also a very big MoPac town. South Omaha was home of the famous stockyards, and by traveling around the city (up and down endless grade changes) by it's own beltway, MoPac would reach Union station with the Missouri River Eagle streamliners. 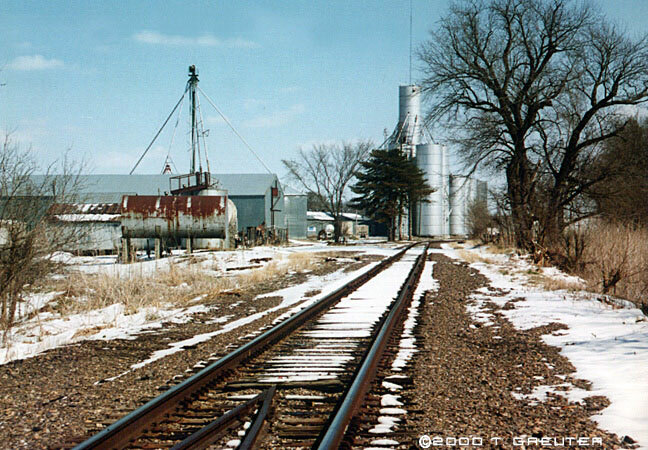 A short jaunt just across the river gave the road access to UP's yards in Council Bluffs, Iowa. MoPac's Omaha Belt-line including the main yard at Nicholas St, the "Alley" switching district, the "short belt" industrial area and and Westside Junction. Here MoPac interchanged with roads such as the CB&Q (later BN), CGW, CNW, CMStP&P, CMStP&O, Rock Island, Illinois Central, UP, and the Wabash. 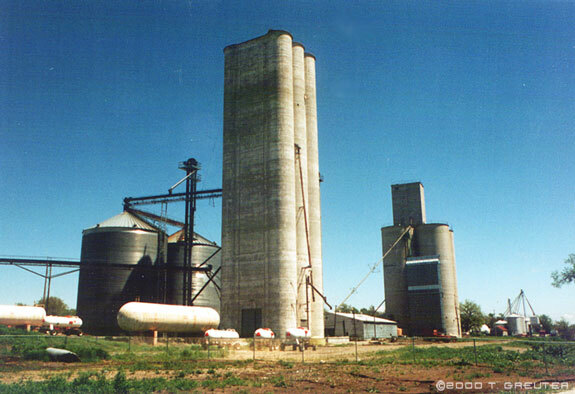 Omaha had the congested feel of industrial areas in the big city and the wide open spaces of a rural mainline. The Belt Line is gone, but the Missouri Pacific mainline continues to provide access south to Kansas City for UP. 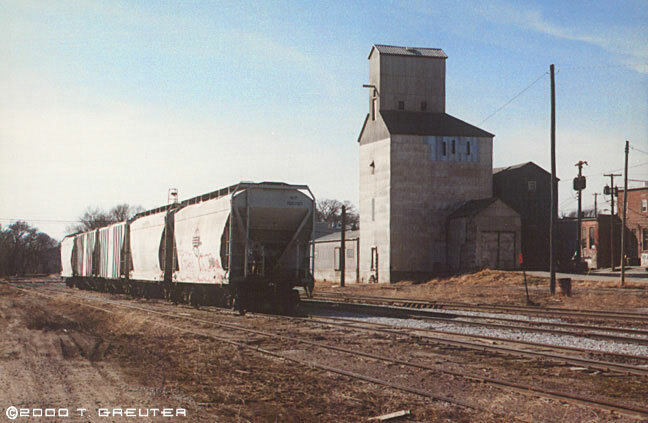 Falls City - Though a far cry from its glory days as a major rail center on the MoPac system, the town of Falls City and the rail line today continue it's mainline service between Kansas City and Omaha under the Union Pacific. Now under UP's control , the former MP Omaha sub is the namesake of today's Falls City Subdivision. The Louisville subdivision originally continued on south to meet up with the Crete sub at Talmage, but was cut back to Avoca, just South of Weeping Water. 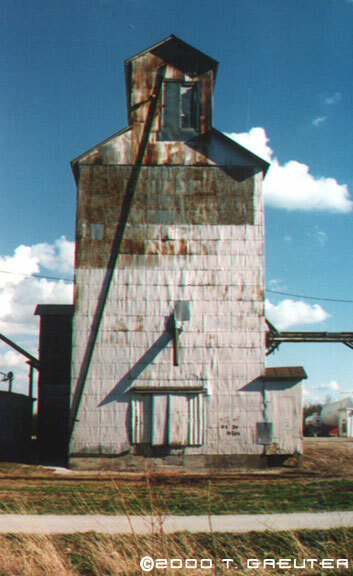 The sub contains some of the most interesting and scenic landscapes of the road's Nebraskan territories. The land from Louisville to Weeping Water is rolling with both industries and limestone outcroppings hugging steep wooded hills. Creeks and quarry ponds meander beside the right-of-way. It's as close to the MoPac's White River / Ozarks region as you'll find in Nebraska. A longtime MoP tradition was the sand run out of Omaha for Louisville and Weeping Water, inspired by the aggragate business of native sand, gravel and limestone of the region. 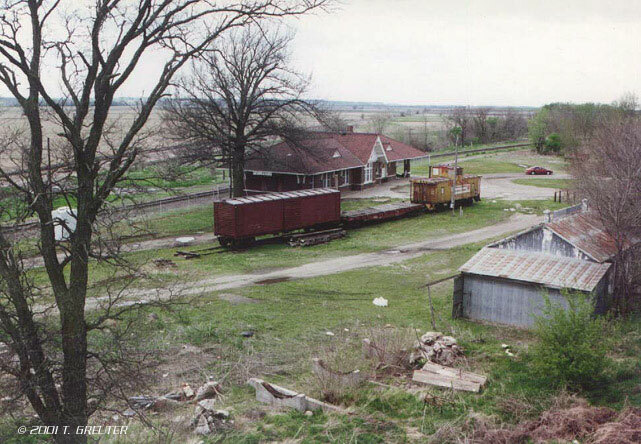 It was responsible for much of the rail business seen at such villages as Weeping Water, Louisville, Nehawka, and La Platte dating back to the days the rock was crushed by hand. It remained strong for many years, and it's still going strong today. 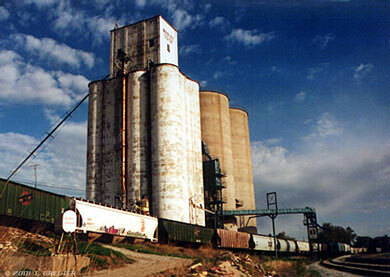 With a strong and dependable rail prescence, fertilizer plants also sprang up in Weeping Water and Louisville. Though this line has been pared back between Omaha and Louisville, it remains alive with activity today from the Union branch, when all other former Mopac branchlines have been eliminated by UP. 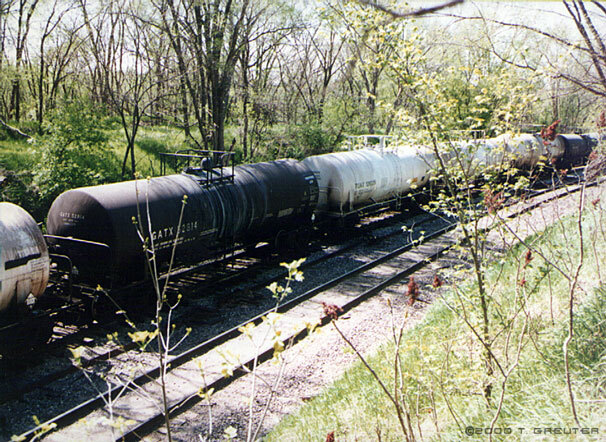 Access to the line now comes from the Union connection, west to Weeping Water, where a turn north takes grain cars to Manley, while coal 2-bay cement hoppers are delivered to Louisville's Ash Grove plant. 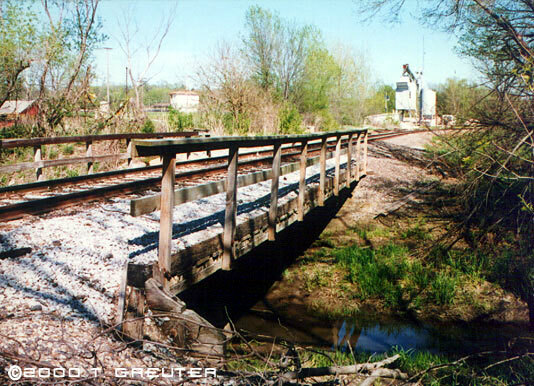 Louisville - the northern anchor of the last surviving MoPac branch in Nebraska. Built in 1929 and still going strong today, Louisville's Ash Grove Lime & Portland Cement Co. plant kept both the MP and BN, the small town's two railroads busy. The plant even saw some business interchanged from the Rock Island up north of the Platte River. With a business shared by both roads, Ash Grove has seen trainloads of coal would go in to fuel the plant and covered hoppers filled with cement pouring out for almost 75 years now. 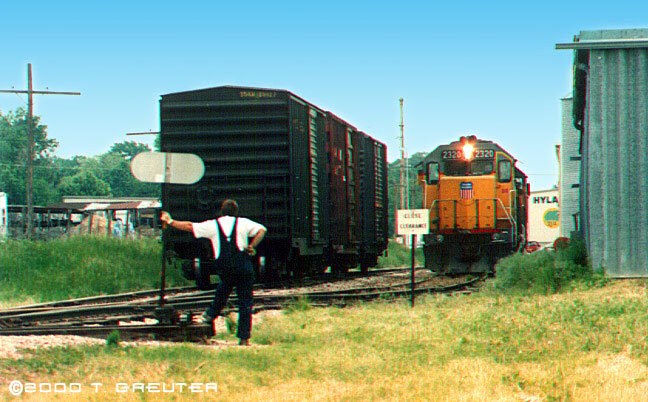 Weeping Water lost it's direct routes to both Lincoln and Omaha after the UP merger, but the importance of the industries here continue to keep rail crews busy moving cars to and from the connection at Union. Where trains once rolled, the MoPac East Trail is Nebraska's largest rails-to-trails conversion. 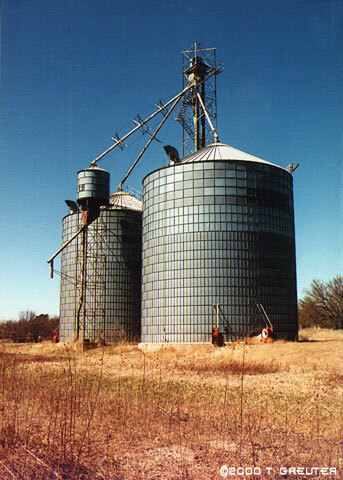 Built in 1993-'94 it extends 25 miles east of Lincoln to Walton, Eagle, Elmwood and Wabash, and was purchased by the donations of more than 5,000 citizens and organizations at $4450,000. Rail service from Union to access Weeping Water's lime industry continues under UP today, while most of the remaining branchline through Lincoln's campus area was recently pulled-up. A village with the romantic name of Weeping Water should have made the MoPac feel right at home with it's Ozark-like setting. Because of huge limestone deposits, it's been called the "Limestone Capital of the World". The UP continues to service Weeping Water by the remining MP trackage from Union. Despite its size, if you liked trains, Lincoln was a good place to be, especially in the 1940's and 1950's during the railroads' zenith. There was the huge presence of the Burlington with its yard at 1st & "J" and it's Havelock shop facilitie, the Chicago & Northwestern, the Rock Island, the MoPac, the U.P. and OL&B (Omaha, Lincoln & Beatrice, a switching service). Lincoln was a college town, but it was just as much a rail town. Weekday passenger traffic scheduled on the Burlington Zephyr was at 26 in the 1940's, four on both the MoPac and the Rock Island, and two on the U.P. The Northwestern only handled freight after the Depression. With the MoPac, the freight arrived in the morning and departed in the evening for Union, Nebraska on the Omaha/Kansas City mainline. Typical steam motive power were 4-4-2, 4-6-0, 4-6-2 and impressive 2-8-0. Occasionally a 2-8-2 would roar into town. 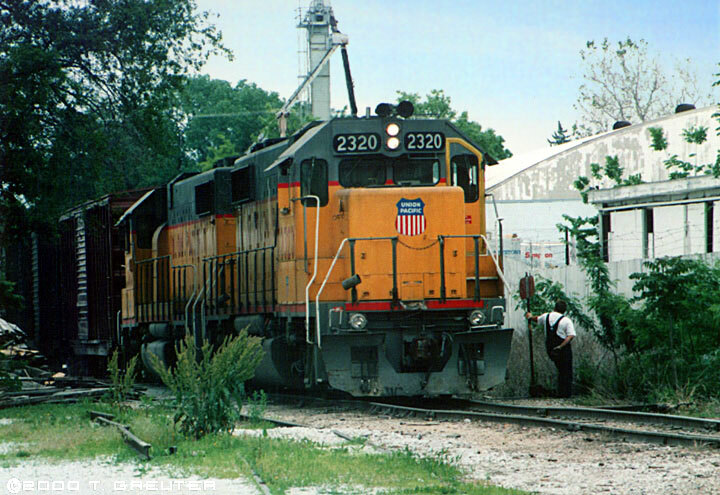 One of the first MoPac diesels to run in Lincoln was an EMD 201-A. Bright red and yellow faced gas/electric motorcars became common on the rails as well. Built in 1942, the streamlined double-ender known as the "Eaglet" was a stand-out among the motorcars running through town. There was nothing else like it. 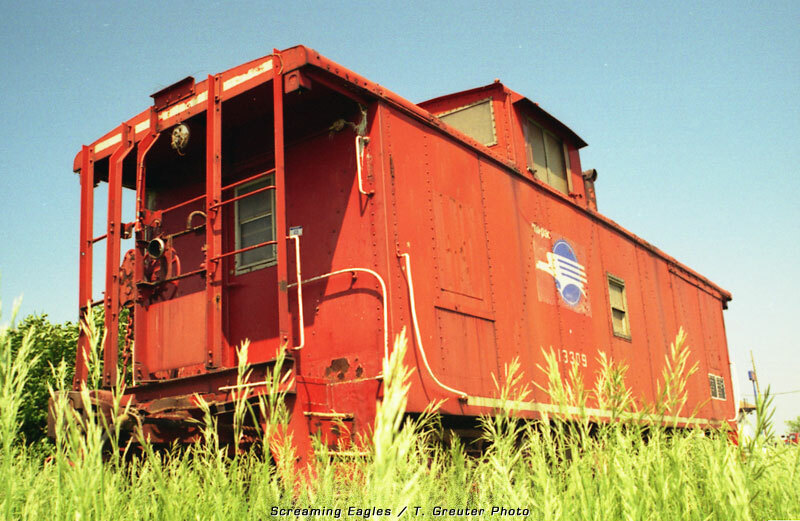 Built by AC&F, the Eaglet #670 provided service on the 47-mile Lincoln/Union Branch as a compliment to the new Omaha/St Louis Eagle Streamliner. After years of shuttling passengers to Union and back, the memberable motorcarÕs last days were spent on the Memphis, Tennessee/Tallulah, Loiusiana run. (right) Grain cars roll along the old Mopac west of 33rd Street. Like the Lincoln Branch, the Crete line, too, was abandoned and it's rails pulled-up. Today the right-of-way otherwise remains untouched, some of it privately owned, running through farmland. When the Louisville sub still extended south to meet the Crete sub, according to system maps I'm guessing Crete Jct. was then called Talmage Branch Jct. It's also referred to as MX Jct in the 1969 timetable. A portion of the Crete Branch at Hickman has been preserved as a bike path. 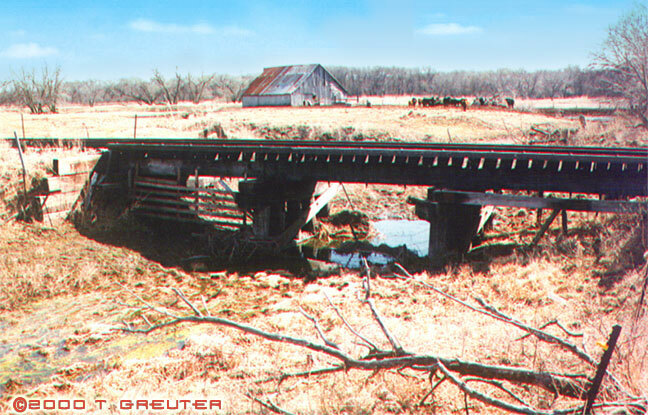 In a pastoral scene east of Sprague, a trestle bridge spans over a ribbon of an irrigation creek. Part of the MoPac's Crete Branch, this area is flat wooded farmland. The Hastings sub originally was a Nebraska extension of the Central Branch Union Pacific in the 1800's, extending from Yuma, in north central Kansas (a few miles west of Concordia) northwest to Prosser, Nebraska. In the late 1930's, the line was cut back 15 miles to Hastings. As WWII unfolded and the country braced itself to fight the war, the railroad commision suggested MoPac should cut off service to the small town of Prosser due to wartime priorities. Hastings then became the end of the line. At the same time, the Naval Munitions Depot was built at Hasting, resulting in the severing and abandonment of the Chicago & Northwestern line there. The abandoned depot and small yards eventually were assumed by the local MoPac. Both the CB&Q and UP gave access east and west, but MoPac provided the the only southeastern rail transport for completed munitions from the naval depot. As the only feed to the southeast from the Naval Munitions Depot , the Prosser division florished, becoming known as the "Million Dollar Railroad" because of the munitions components (such as shell casings) that flowed to Hastings upon the MoPac. Today the Prosser line is abandoned. By the time of the UP merger, the "Million Dollar" line was a memory and it once again returned to it's former branchline status. 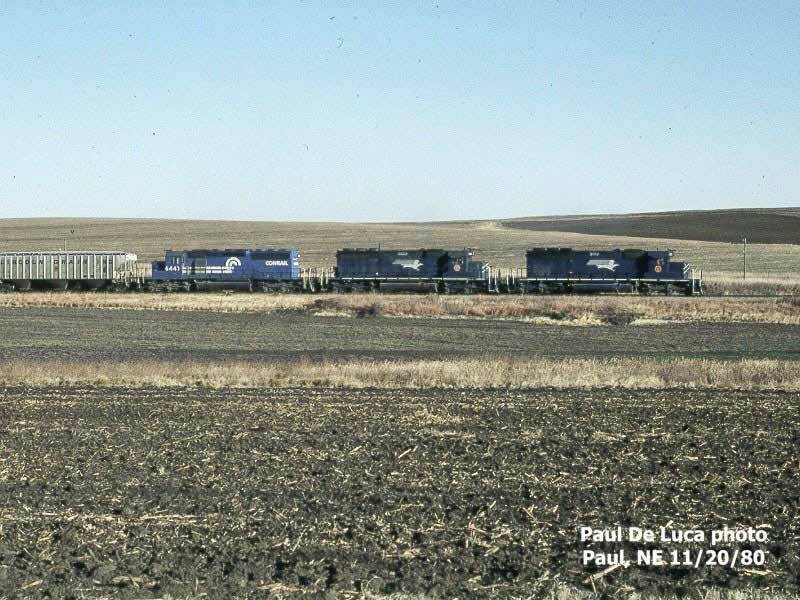 GP15-1 #1675 made the final run from Concordia, Kansas to Hastings on March 1, 1985. The small loco went south back to Kansas, never to return.